These bite-sized Feta Stuffed Peppers are bursting with spicy, tangy, sweet and zesty flavor. This delicious Mediterranean-style vegetarian finger food is ready in just 10 mins! 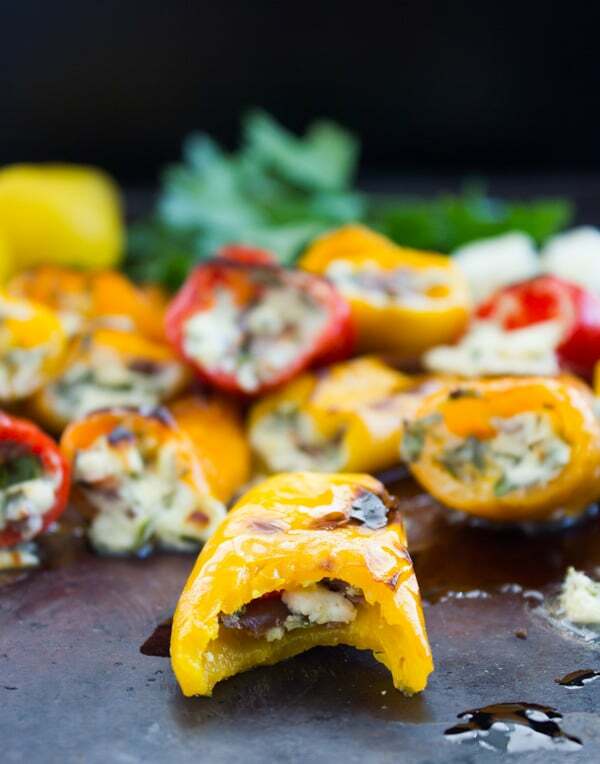 A mixture of zesty, tangy, spicy and herb loaded feta cheese is stuffed into mini colored bell peppers to create this Mini Zesty Feta Stuffed Peppers Recipe. 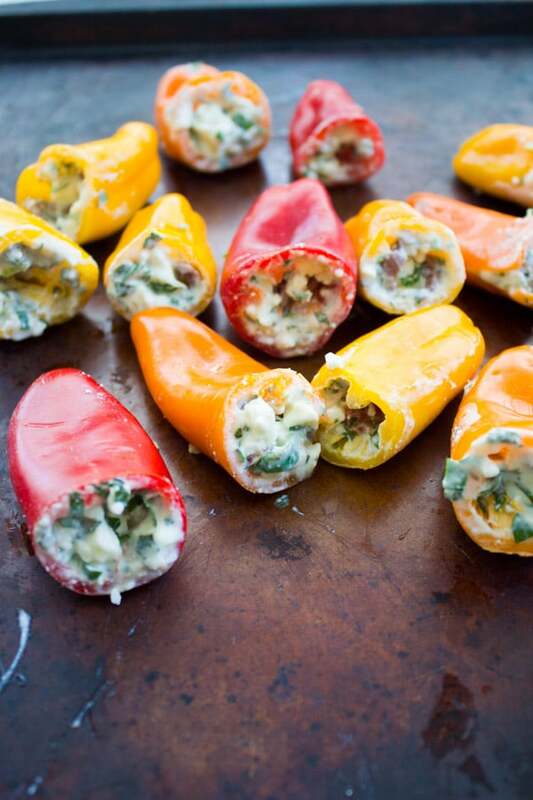 The peppers are then broiled for a char flavor which perfectly compliments the freshness of these stuffed peppers. Super easy appetizer or finger food that you can make way ahead of time. Sweet, salty, tangy, spicy, slightly crunchy and ultra refreshing! More appetizers, finger food and Game Day snacking are happening here. Are you all preparing for the Game? I feel like every year I freshen up my menu a bit more. So last year I posted this Mediterranean Super Bowl Recipes round-up—which is also a combo of fresh finger foods for the Game. It was a potluck and everyone got to make 1-2 easy recipes to bring on, all super simple and perfectly complimenting each other. This year I’m changing things a bit. No potluck and no particular ethnic food. 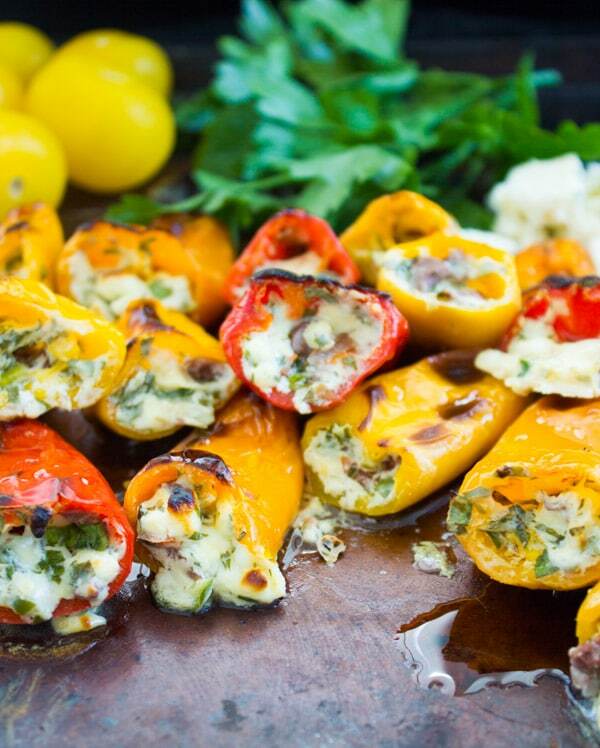 So just a menu of healthy tiny bites like these feta stuffed peppers. When it comes to appetizers, the simpler the better. Obviously, the selection of recipes makes a big difference, so always chose easy appetizers you can prepare ahead of time to make your day less stressful. That’s not to say you’re skimping on any flavors or indulgence with these feta stuffed bell peppers. It’s more of the “Work Smart not Work Hard” motto. Please don’t just make this stuffed bell peppers recipe for the Big Game just to forget all about it when its BBQ season! Since they’re easily and perfectly made on the grill too, these feta stuffed peppers are AWESOME for grill season and Memorial Day. The beauty of it is using those mini colored peppers which are so incredibly sweet and tender. They cook in a blink and they still keep their shape even if for any reason you overcooked them. If you’ve read my Chicken Shawarma in Lettuce Cups recipe, another bite-size light and fresh item on this year’s menu. I mentioned some of my favorite food prep tips for the Big Game, so check it out! The feta stuffing is what I have to talk about. Put aside the fact that I adore Feta and Greek food. Let’s forget about my affinity for Turkish flavors from a Turkish grandma, and everything else personal. 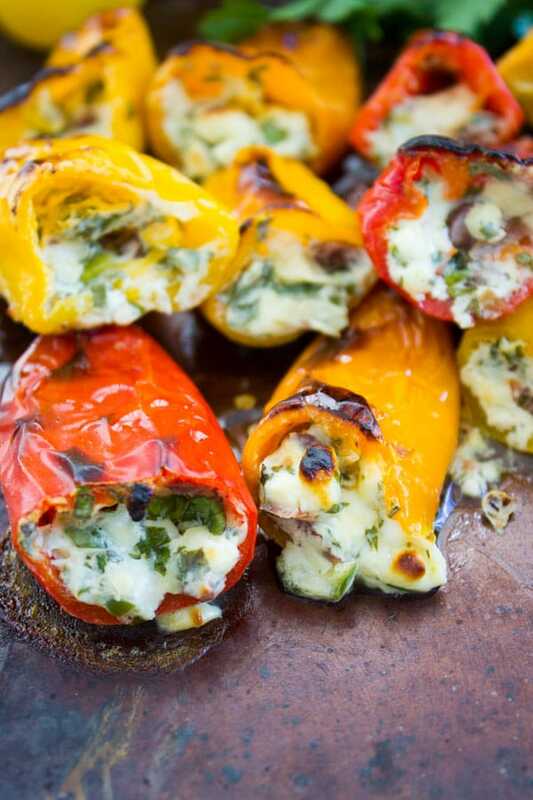 This zesty feta filling I use for the stuffed peppers is delicious just eaten by the spoon! It’s basically crumbled Greek feta cheese, mixed with lemon zest and a touch of lemon juice, sour cream, and a hint of garlic. Then we add some chopped green chili, plenty of fresh chopped herbs, scallions, and chopped kalamata olives. A touch of Sumac spice (optional but so very worth it!!) and it’s ready! 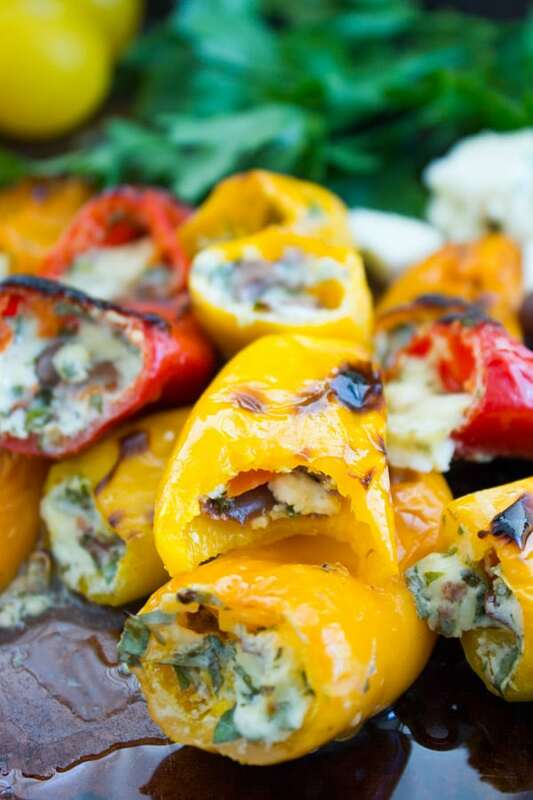 These feta stuffed peppers can be grilled, baked or broiled, or frankly left raw and crunchy as is. I prefer a nice char flavor on my stuffed peppers, so when it’s BBQ season, I throw them on the grill for 3 minutes per side and when it’s freezing cold like today, I broil them for 5-6 minutes. Either way, they’re done within minutes! The feta mixture you can easily adapt to your taste, so add in herbs, add a chopped tomato, leave out the olives and add some olive oil or season with some Zaatar blend spice. You can get so much info about Zaatar blend and how to make it in this fabulous Labneh Dip with Zaatar Pistachio Mint Olive Topping recipe! Note that the feta mixture can be made well ahead of time ( a week or more—but without tomatoes) and stored in an airtight container in the fridge. 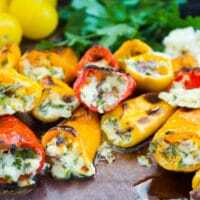 Want to serve these stuffed peppers cold? Simply broil them and keep them in the fridge for up to 3 days before serving. These bite-sized Feta Stuffed Peppers are bursting with spicy, tangy, sweet and zesty flavor. The ultimate vegetarian finger food in 10 mins! Preheat the broiler to high or the grill. 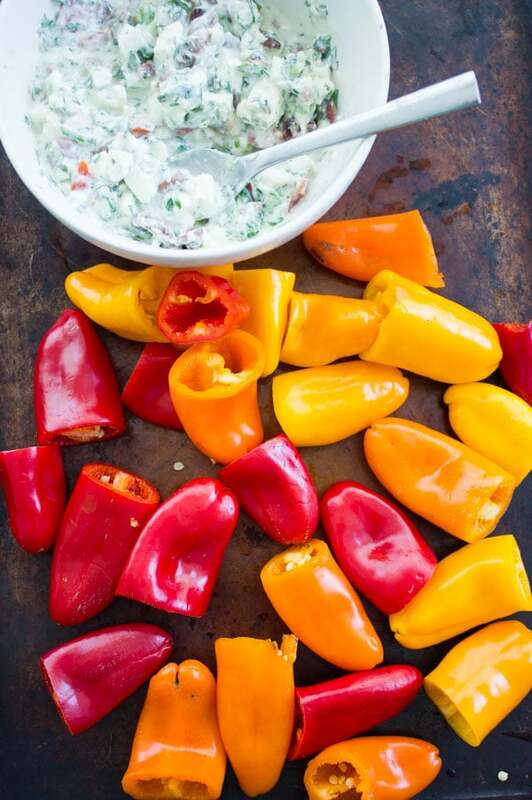 On a baking sheet, lay the mini peppers in a single layer. They usually have no seeds, so once the tops are cut off they're ready for the filling. Sprinkle a pinch of salt and olive oil over the peppers and toss gently. Keep them always in a single layer. For the Feta filling: Mix all the ingredients in a medium-sized bowl. Use a teaspoon, place a teaspoon size filling inside each of the mini peppers. Make sure NOT to overfill the peppers. Any remaining feta mixture can be stored in the fridge for a week minimum—so long as it has no tomatoes **. Place the pan in the broiler over and broil for 5-7 minutes until peppers are charred and tender. If grilling, place the pepper on the grill and grill for 3 minutes per side. Serve right away or chill in the fridge for up to 3 days. **If using tomatoes in the feta mixture, it can only last in the fridge for 2 days. If not, then it lasts at least a week. I am not familiar with the Zaatar spice blend. What’s in it? 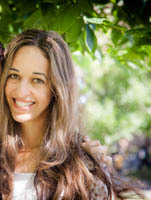 Hi Yvonne, Zaatar is an amazing spice blend! Plenty of dried thyme leaves, plenty of sesame seeds, little bit of anise, fennel, caraway and some sumac (a lemon-ish flower spice). You’ll find it at Middle Eastern and Turkish stores or in the ethnic section of a good high end grocery store.